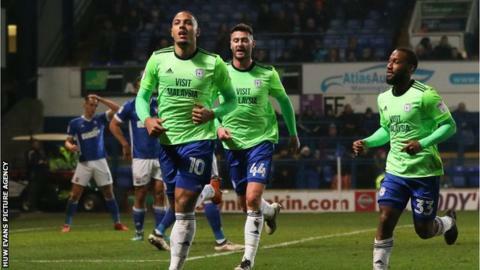 Cardiff City moved four points clear of third place with a hard-fought 1-0 win against Ipswich at Portman Road. Cardiff, who lost Sean Morrison to injury after 40 minutes, took the lead through Kenneth Zohore after an hour. Grant Ward and Adam Webster had Ipswich's best chances but Cardiff held firm thanks to some heroic blocks by Sol Bamba and Bruno Manga. Ipswich drop to 14th whilst Cardiff widen the gap over Aston Villa to four points. The Bluebirds have now gone seven league games without defeat but the loss of their captain will be a concern. Morrison missed five games between December and January and Cardiff lost four of their fixtures in his absence - more than they've lost in the 27 league games he's started. The Cardiff captain was not the only notable absentee at the back for the Welsh side. Neil Warnock revealed after the match that Armand Traore, Joe Bennett and Lee Peltier all picked up injuries in the last 48 hours, with Peltier expected to be out for a month, while Ipswich boss Mick McCarthy confirmed striker David McGoldrick could miss the rest of the season after tearing his groin in training. However, the Bluebirds were boosted by the return of Gary Madine and Craig Bryson and there was further cause to celebrate when Kenneth Zohore scored his first goal since Boxing Day. Cardiff made three changes for the trip to Ipswich, Loic Damour making his first start in 2018. The Bluebirds could have been ahead in the first minute. A corner-kick fell to the feet of Matthew Connolly who - on just his second league appearance this season - pulled his effort wide from 12 yards. The rest of what was a disjointed first half was dominated by the hosts, but Neil Etheridge was not called into action enough for all Ipswich's pressure. The Philippine goalkeeper was equal to Grant Ward's curling effort before Bamba got his body in the way of Luke Hyam's driving shot. Cardiff brought £5m January signing Gary Madine on at half-time and the Bluebirds looked a different team for his inclusion. And it was Madine who nodded the ball down for Zohore to open the scoring. The Danish striker missed his attempted spectacular volley but managed to poke home the ball at the second time of asking. Ipswich rallied late on as they searched for an equaliser but Greg Halford and Bruno Manga appeared to get themselves in the way of every chance the home side conjured up. The results compounded a miserable few days for McCarthy's side who conceded in the dying seconds of the East Anglian derby on Sunday. "All credit to the lads they've been fantastic. "Some players haven't played for a long time have come in and Gary Madine was probably not fit to play but I couldn't see us getting anything without him and he changed the game. "I think it took the pressure of Kenneth Zohore with Gary next to him and I'm sure we will be able to do that again. "Ours was the biggest result tonight." "I thought the lads were excellent and gave everything as usual - they were just very, very good. Having lost a few players in the last few days the ones who came in I thought they were great. "Playing against 6ft 5in centre forwards they may beat one or two of my players in the air and I thought it was a soft free-kick (which led to the Cardiff goal). "I was delighted with the team and they gave everything and I was very pleased with the front three. I thought they were very good." Match ends, Ipswich Town 0, Cardiff City 1. Second Half ends, Ipswich Town 0, Cardiff City 1. Craig Bryson (Cardiff City) is shown the yellow card. Corner, Ipswich Town. Conceded by Bruno Ecuele Manga. Attempt missed. Freddie Sears (Ipswich Town) right footed shot from the centre of the box misses to the right. Assisted by Callum Connolly with a headed pass following a set piece situation. Substitution, Cardiff City. Craig Bryson replaces Kenneth Zohore. Adam Webster (Ipswich Town) wins a free kick in the attacking half. Attempt blocked. Martyn Waghorn (Ipswich Town) left footed shot from outside the box is blocked. Assisted by Jonas Knudsen. Substitution, Ipswich Town. Kevin Bru replaces Grant Ward. Corner, Cardiff City. Conceded by Adam Webster. Attempt blocked. Loïc Damour (Cardiff City) right footed shot from outside the box is blocked. Assisted by David Junior Hoilett. Attempt missed. Kenneth Zohore (Cardiff City) left footed shot from outside the box misses to the right. Assisted by Gary Madine with a headed pass. Substitution, Ipswich Town. Martyn Waghorn replaces Jordan Spence. Corner, Ipswich Town. Conceded by Matthew Connolly. Corner, Cardiff City. Conceded by Callum Connolly. Attempt missed. Grant Ward (Ipswich Town) left footed shot from the right side of the box misses to the left. Assisted by Bersant Celina. Substitution, Ipswich Town. Callum Connolly replaces Luke Hyam. Attempt missed. Kenneth Zohore (Cardiff City) header from the centre of the box is too high. Assisted by David Junior Hoilett with a cross following a set piece situation. Hand ball by Jordan Spence (Ipswich Town). Goal! Ipswich Town 0, Cardiff City 1. Kenneth Zohore (Cardiff City) left footed shot from the centre of the box to the bottom left corner. Assisted by Gary Madine with a headed pass following a set piece situation. Gary Madine (Cardiff City) wins a free kick in the attacking half. Bersant Celina (Ipswich Town) wins a free kick in the defensive half. Attempt missed. Loïc Damour (Cardiff City) right footed shot from outside the box misses to the left. Assisted by Nathaniel Mendez-Laing. Attempt blocked. Nathaniel Mendez-Laing (Cardiff City) right footed shot from outside the box is blocked. Assisted by Kenneth Zohore. Attempt blocked. Loïc Damour (Cardiff City) left footed shot from outside the box is blocked. Foul by Adam Webster (Ipswich Town).